Universal CityWalk is the name shared by the entertainment and retail districts located adjacent to the theme parks of Universal Parks & Resorts. CityWalk began as an expansion of Universal's first park, Universal Studios Hollywood, and serves as an entrance plaza from the parking lots to the theme parks. CityWalk can also be found at Universal Orlando Resort in Florida and Universal Studios Japan in Osaka, Japan. CityWalk Hollywood and CityWalk Orlando have some common tenants, but their respective architectural styles are quite different. Where CityWalk Hollywood incorporates a classic modern blend of Hollywood, CityWalk Orlando is almost entirely modern in appearance. City walk is separate from Universal Studios Hollywood it serves as an entrance from the parking lot that does lead to Universal Studios. Inspiration came from the Horton Plaza according to Jon Jerde, the architecture of City Walk Hollywood tries to capture the architecture found all over Los Angeles. Universal CityWalk Hollywood is a three-block entertainment, dining, shopping promenade. It has more than 30 places to eat, a 19-screen movie theater featuring IMAX,7 night spots, indoor skydiving and more than 30 stores. Designed by Jon Jerde, CityWalk opened in May 1993 adjacent to the Cineplex Odeon cinema. A $1 billion, 93,000 sq ft (8,600 m2). expansion opened in 2000. Planning done by Jerde Associates. CityWalk's central plaza is topped by a 170-foot radial trelis designed and built by Pearce Structures (who also constructed Biosphere 2). The courtyard features a leaping fountain, created by WET. A huge television monitor brought in by Panasonic, is located above the multiplex, showing upcoming Universal movie releases, music videos, and NBCUniversal promotions stands next to the giant guitar towering over the Hard Rock Cafe. Street performers (magicians and musicians) are a common sight. "5 Towers" is an interactive outdoor concert venue on Universal CityWalk, featuring a technologically advanced staging system. The stage is equipped with thousands of LED fixtures, motion capture sensors, five soaring 42-foot light tower sculptures, a massive video monitor, and a state-of-the-art audio system. The new staging system serves as the structural artistic centerpiece for CityWalk. It features live music. 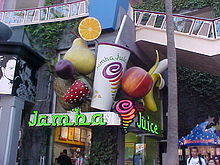 A Jamba Juice store located along the CityWalk in Universal Studios Hollywood. The Universal CityWalk in Orlando opened in 1999 as one component of the expansion that transformed Universal Studios Florida into today's Universal Orlando Resort. It was built over the former Universal Studios parking lot and entrance. Guests arriving at the resort park in one of two multi-story parking structures then travel via covered moving sidewalks over Universal Boulevard into CityWalk. From there, guests can proceed into either of the theme parks: Universal Studios Florida or Islands of Adventure. Hard Rock Cafe Orlando – This is the second Hard Rock Café built on Universal property. The first café was built near the Psycho house, Bates Motel, E.T. Adventure, and Fievel's Playland. Although the first café was considered to be one of the largest in the chain, the company closed down the restaurant to reopen in an even bigger facility and alongside Hard Rock Live in the CityWalk section. The old Hard Rock Café building was demolished in October 2011. Pat O'Brien's Bar – a franchise of the original bar/restaurant in New Orleans. Universal Cinemark at CityWalk, previously operated by Loews Theatres until January 26, 2006, when AMC Theaters merged the Loews Theatres chain, and previously operated by AMC until 2018. CityWalk's Rising Star (Karaoke Club featuring Live Band and Backup Singers & Dancers) – opened April, 2008, replacing CityJazz. Blue Man Group Sharp Aquos Theatre, a live show featuring Blue Man Group (Formerly Nickelodeon Studios, which was not considered to be a part of CityWalk). Jimmy Buffett's Margaritaville, Live bands take to the restaurant's stage to perform every evening. Hollywood Drive-In Mini Golf – A miniature golf course harkening back to 50's era drive-in movies. The facility has two different and intricately themed courses: "The Haunting of Ghostly Greens" and "Invaders from Planet Putt-Putt". Opened in March 2012. ^ SMITH, DOUG (1993-05-25). "Celebrating L.A. Icons : Universal CityWalk Is for Real--Almost". Los Angeles Times. ISSN 0458-3035. Retrieved 2018-12-09. ^ NELSON, JIM (2000-04-24). "The Real Mastermind Behind CityWalk". Los Angeles Times. ISSN 0458-3035. Retrieved 2018-12-09. ^ "Peter Jon Pearce site – Building Systems Developments – other projects". ^ "English & Chinese Floor Map". This page was last edited on 10 April 2019, at 15:52 (UTC).